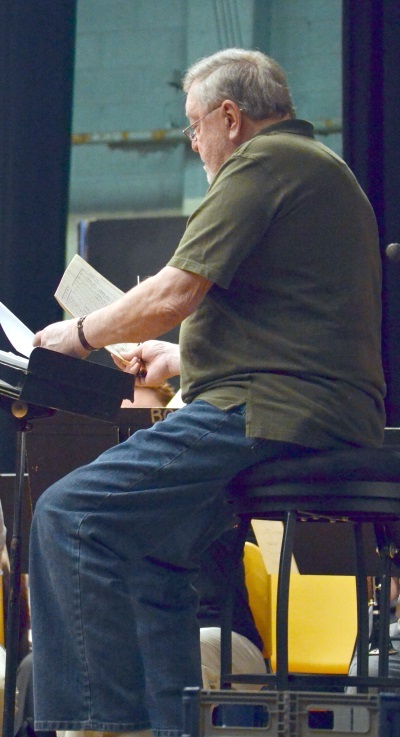 Jerry Nowak, our beloved music director, passed away on December 14, 2015 after a lengthy illness. Internationally acclaimed musician, composer, arranger, director, husband, father and friend to many, Jerry will be sorely missed by all members of The Delaware Valley Wind Symphony. The Delaware Valley Wind Symphony will continue on as his musical legacy. Rest in Peace, Jerry. You were loved. Jerry was Professor of Music at Bucks County Community College in Newtown, Pennsylvania, from 1969 to 2005. With over 850 compositions and arrangements for instrumental and vocal ensembles, Jerry was one of the most widely published composers and arrangers of the past forty years. Jerry studied composition and orchestration with Lucien Cailliet (arranger for The Philadelphia Orchestra under Leopold Stokowski and Eugene Ormandy), clarinet with Charles Russo, voice with Herbert Pate and choral conducting with Dr. Finley Williamson. He held a B.S. in Music Education and Master of Music Composition from Trenton State College. Jerry appeared extensively throughout the United States as a guest conductor, clinician and adjudicator. He lectured at many colleges and universities throughout North America and Australia. Early in his career he worked as a woodwind doubler and session singer in New York and Philadelphia. He toured with Burt Bacharach and played with many big bands, jazz and R&B groups on the east coast. He was a founding and active member of the Philadelphia Saxophone Quartet and New Jersey Saxophone Quartet. Jerry earned an international reputation for his innovations in the techniques and teaching of expressive phrasing. In 2002 Carl Fischer published Conducting the Music, Not the Musicians, a ground-breaking conducting text co-authored with his brother Henry Nowak. His phrasing book series, The Art of Expressive Playing (also co-authored with Henry) was published in October, 2004 by Carl Fischer, and is recognized as the first and only comprehensive text book on expressive performance. Jerry conducted numerous professional recording sessions in New York, Philadelphia, Washington, DC and London. He was also the conductor and arranger for Jim Gafgen, a popular tenor who performs in the New York and Philadelphia areas. For almost three decades Jerry taught in Sydney on behalf of the Australian Band and Orchestra Directors’ Association in New South Wales. In 2003 the association named the Jerry Nowak Conducting Summer School in his honor. Jerry appeared in the 2004 and 2005 editions of Who’s Who in America, published by Marquis. The Delaware Valley Wind Symphony was privileged to have Jerry Nowak as its Music Director. I appreciate [Jerry’s] support for our efforts at CR North and his encouragement to the student musicians with whom he worked. One look at the music library at CR North and it’s easy to see the impact he had on music for education. Certainly a musical life worth celebrating!